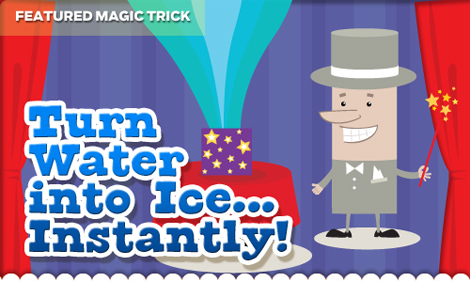 Turn Water to Ice… Instantly! Put the dry sponge securely in the bottom of the cup so it won’t fall out if you turn the cup over. Put the ice cube in the cup on top of the sponge. Pour a small amount of water into the cup. Say some magic words and turn the cup upside down. The ice cube will fall out but the sponge will have soaked up the water!